Three. 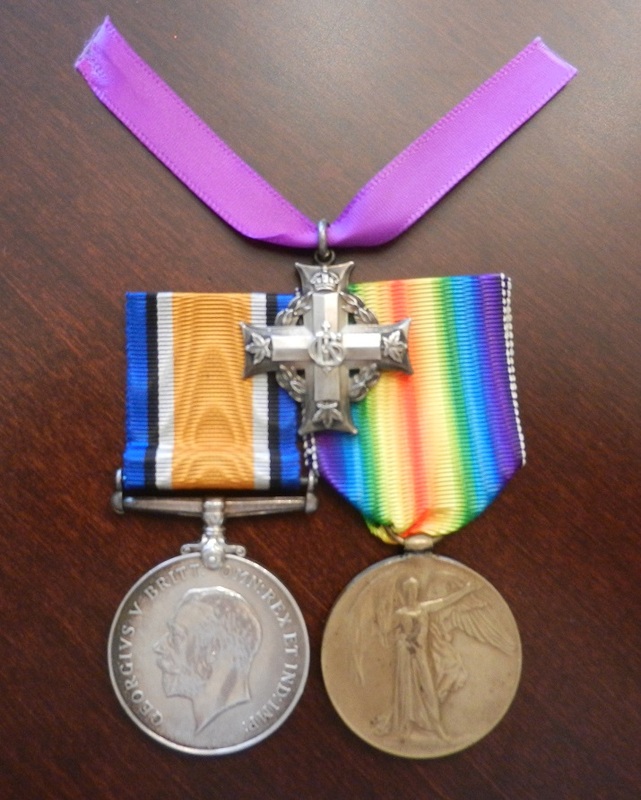 British War Medal 1914-20, Victory Medal, and Belgian Croix de Guerre. Named to 420779 SJT. W.N. ROBB. 43-CAN. INF. on pair. William Nicoll Robb was born in Forfar, Scotland on 20 March 1894, and was working as a farmhand when he attested for the CEF at Winnipeg on 28 December 1914. An original member of the43rd Bn CEF, he served in France from 20 February 1916. While he had earned promotion to Serjeant by July 1917, he was reduced to the ranks after a Field General Court Martial that month, only earning promotion to LCpl again in early 1918. He was wounded twice, by gas shell on 16 August 1918, and by a GSW to the face on 1 October 1918. By that time, he had regained his Serjeant rank. He was awarded the Belgian Croix de Guerre in London Gazette 31275 of 5 April 1919. Electronic copy of service record available online at LAC website. Medals swing mounted as worn, a little grubby and on original soiled ribbons, accompanied by a 43rd Bn CEF cap badge which has had one lug repaired, and a 1935 Bexhill On Sea Jubilee Celebration commemorative medal. There were only 389 awards of the Belgian Croix de Guerre to the CEF during the First World War, making this a relatively scarce honour. Four. Queen's South Africa Medal with clasps 'Cape Colony', 'Orange Free State', 'Transvaal', 'South Africa 1901', 'South Africa 1902', 1914-15 Star, British War Medal, and Victory Medal. Named to 28383 PTE. H.C. FERRIS. 92ND COY IMP:YEO:. on QSA, to 76 TPR. H.C. FERRIS. R.CAN:DNS on Star, and to 76 SJT. H.C. FERRIS. R.C.D. on pair. Henry Christie Ferris joined the RCD at Pond Farm on 26 November 1914. He was originally from Truro, Cornwall, and was a woodsman before enlistment, listing his next of kin as living in Vancouver, British Columbia. Ferris arrived in France in May 1915, serving with the Royal Canadian Dragoons, and with the Canadian Cavalry Brigade Machine Gun Squadron, joining the latter formation on 20 February 1916. He was briefly attached to the Officer Cadet Unit in England in May 1917, before being transferred in October 1917 to the Canadian Forestry Corps, likely taking advantage of his pre-enlistment occupational skills. Group is court-mounted on clean ribbons and medals are in EF Condition. Comes with paper copy of portions of service record. A nice group to an original 1st Canadian Division Royal Canadian Dragoon, who served with the unit at the front during their time in the trenches as infantry at Festubert; medals to First World War Canadian Cavalry Brigade servicemen are relatively scarce given the small size of the units in this formation, and their limited personnel throughput in comparison to the infantry and other corps during the war. Four. 1914-15 Star, British War Medal 1914-20, Victory Medal and Memorial Plaque in cardboard carton of issue with Buckingham Palace letter. Named to 116024 PTE. W.T.I. MONTGOMERY. 2/CAN:MTF:RIF: on Star, to 116024 PTE. W.T. MONTGOMERY. 2-C.M.R. on pair. and to W.T. MONTGOMERY on plaque. Willoughby Tichborne Montgomery was born in Edmonton, Alberta on 22 May 1896. He indicated his profession on enlistment as 'rancher's son'. Montgomery joined the 11th Canadian Mounted Rifles at Vancouver, British Columbia on 23 March 1915. He landed in France 22 September 1915, and besides a short 10 day leave from 31 March - 9 April 1916, appears to have served with his unit continuously. Montgomery was killed in action on 28 July 1916, and he is buried in Poperinghe New Military Cemetery, Belgium. Medals are unmounted, on clean original ribbons. Box for plaque is slightly torn at one edge, and condolence letter has some minor creases. Three. 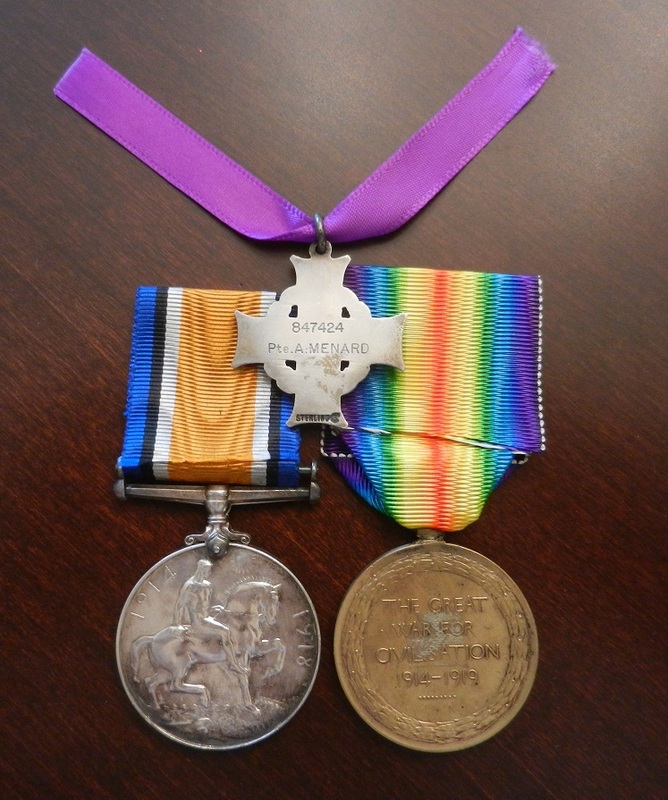 1914-15 Star, British War Medal 1914-20 and Victory Medal. Named to 40714 GNR: A. H. SMITH. CAN: FD: ART: on Star, and to 40714 DVR. A.H. SMITH. C.F.A. on pair. Arthur Harold Smith was an original member of the 1st Canadian Division, who enlisted in Kingston, Ontario on 12 August 1914, and arrived in France as part of the 1st Canadian Artillery Brigade on 8 February 1915. Electronic service record is available online at LAC website; it indicates that Smith spent a lot of time under disciplinary proceedings for absence without leave (AWL) offences, and was medically unfit due to illness from August 1917 until the war's end. Medals court mounted on clean modern ribbons. Three. 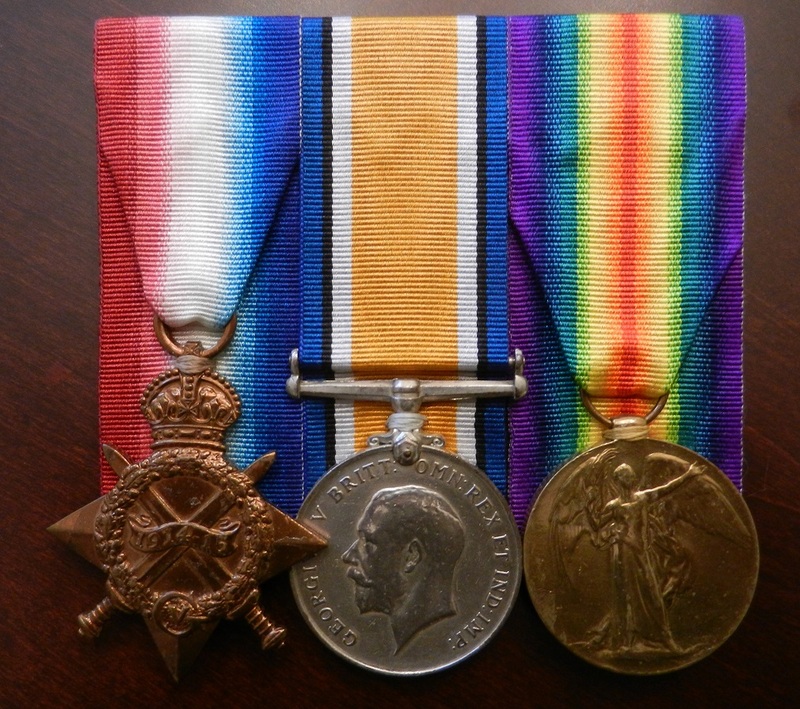 1914-15 Star, British War Medal 1914-20 and Victory Medal. Named to 49501 PTE. R. SIFORD. CAN: A.S.C, on Star, and to same number, name but C.A.V.C. on pair. Reginald Siford was born in Northleach, England on 18 February 1890, and was a painter in civilian life. He attested for the CEF at Winnipeg in April 1915, and served with 5 Stationary Hospital, 1 Canadian Veterinary Hospital, and 1 Canadian Forestry Corps. Electronic copy of service record available online at LAC website. Medals mounted as worn, a little grubby and on original soiled ribbons. Three. British War Medal, Victory Medal, and Memorial Cross (GV). Named to 847424 PTE. A. MENARD. C.A.M.C. on pair, and to 847424 Pte. A. MENARD on Memorial Cross. Albert Menard joined the 150th Bn CEF, attesting in Montreal on 12 February 1916. He was originally from Granby, Quebec, and was a laborer before enlistment. He transfered to the Canadian Army Medical Corps on 20 August 1916, and arrived in France on 1 September 1916. He was killed during an aerial bombardment by German Gotha bombers during an attack on the Etaples military complex in France on 19 May 1918, which was targeting a bridge on the River Canche but also struck No. 1 and No. 7 Canadian General Hospital. Group is loose on original ribbons; medals could use some cleaning but are in good VF Condition otherwise. Comes with paper copy of portions of service record, details of his burial location at Etaples Military Cemetery in France, photographs of his headstone there, and some information on the 19 May 1918 German air raid which hit the Etaples hospital. There were 66 Canadians killed and 73 wounded in the raid; medals to First World War servicemen killed in air raids are very scarce. Two. 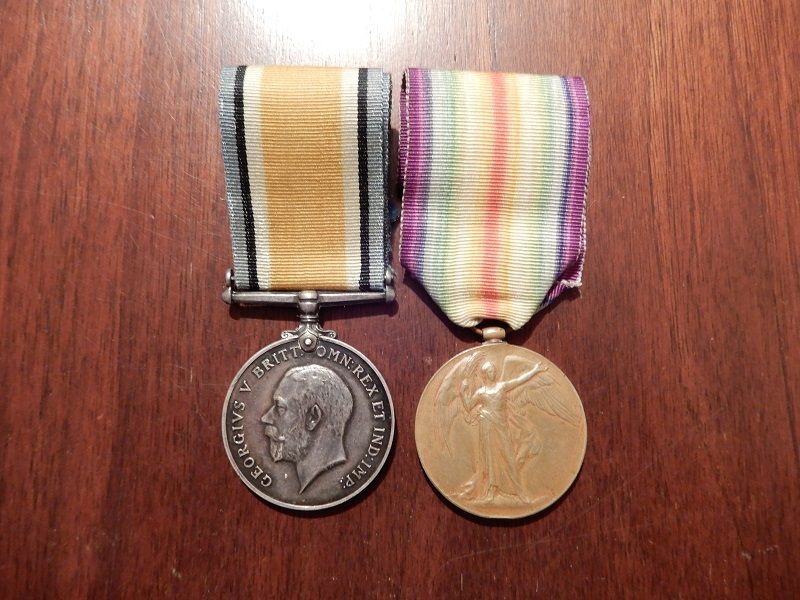 British War Medal 1914-20 and Victory Medal. Named to 3310563 PTE. C. L. YOUNG. C.M.M.G. BDE.. Charles Lafayette Young was born in London, Ontario, and was working as a glycerine maker when he was drafted under the Military Service Act in January 1918. He served in France with the Canadian Motor Machine Gun Brigade. Medals named to the CMMG Bde are relatively scarce, and this unit saw a great deal of fighting during the last 100 days of the war in the lead-up to the Armistice. Medals unmounted, on clean original ribbons. Two. 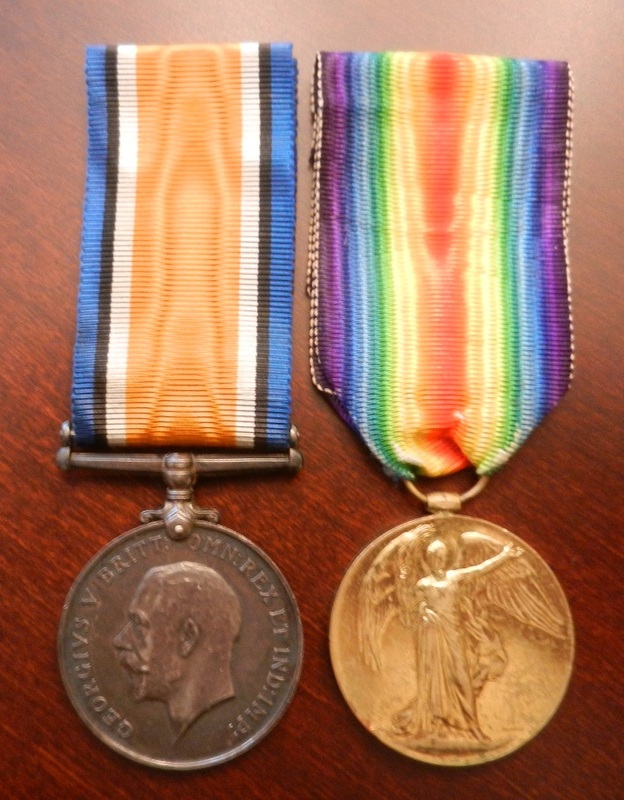 British War Medal 1914-20 and Victory Medal. Named to 469417 SJT. F. ASH. 24-CAN.INF.. Francis Ash was born in Harbour Grace, Newfoundland, and he joined the 64th Battalion CEF on 13 August 1915 in Sydney, Nova Scotia. He was transfered to the 24th Battalion CEF in England in June 1916, joining the unit as a reinforcement in France on 14 July 1916. Ash was promoted Corporal in November 1916, and was promoted Serjeant on 9 April 1917, replacing a comrade who was killed in the battle of Vimy Ridge. He was killed in action on 5 May 1917, and he is commemorated on the Vimy Memorial, France. Medals are on loose faded original ribbons. A very scarce casualty pair to one of the 3296 Newfoundlanders who served in the CEF during the First World War. One. 1914-15 Star. Named to 10283 PTE. G.A. BAKER. HAMPS: R.. George Albert Baker died on 21 August 1915 while serving with the 10th Battalion Hampshire Regiment at Gallipoli. He is commemorated on the Helles Memorial in Turkey. Medal unmounted, on clean original ribbon.